Project #1: Become more mass-market. The Rudolphs wanted to go mainstream and stock Banza alongside the Barillas and Ronzonis of the world, going after the everyday pasta eater. So in 2015 they hired branding firm Roger and design agency Gander. 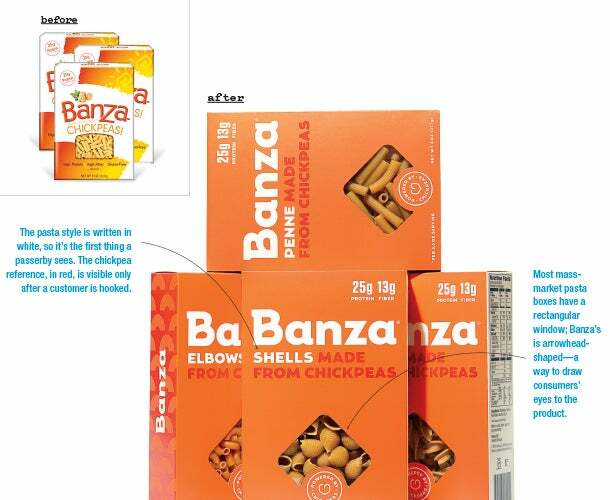 First step, says Roger founder Gillian Grefé: Understand Banza’s new market. “Grocery stores are filled with healthy alternatives, and what do you see on the front panel of the packaging? Every health benefit, every claim, a lot of noise. That would intimidate our target consumer,” says Grefé. The mass-market pasta aisle, however, is a place of minimalist packaging and few health claims. Project #2: Become more sophisticated. 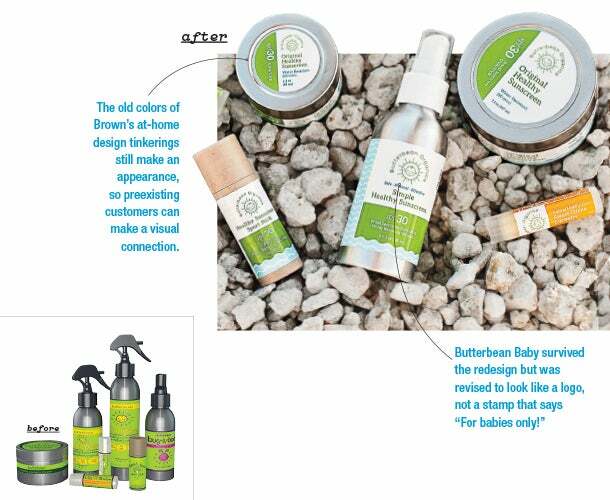 Summer Brown began hand-making an all-natural sunblock for her kids in 2013 and sold it online as Butterbean Sunscreen. “The branding was really basic -- silly hometown-printshop-style stuff,” she says. Even the logo, which she called the Butterbean Baby, was hand-drawn at home. When the labels would get wet, the ink would run. But as sales rose, she had little time to upgrade. In fact, she was so busy that when she went into labor with her fifth child, she made a pit stop at the post office -- because there were orders she needed to ship. The bottles’ colors were revamped: Gone was the yellow, which was unusual in the marketplace, and in came white (to project cleanliness) and aqua (standard for beach products, but made lighter to appear premium). The company’s name was tweaked, too. Brown had begun making bug spray, lip balm and more -- but had kept the name Butterbean Sunscreen. It became Butterbean Organics. And the agency produced a promotional photo shoot with Brown and her family at the beach. “She’s such a big part of the company story. We wanted that to come through,” Lagerman says. “It’s something that young dads, busy moms, teens, tweens and little kids are equally drawn to,” Lagerman says. The rebrand debuted last June and triggered a roughly 40 percent uptick in sales. A few national accounts have since signed on. But the packaging’s first big test is wrapping up now -- January to March, big retailers’ prime sunscreen-buying time. Project #3: Become more trustworthy. Next, it was time for a redesign. “We need to use color as a strong way to get users in the right emotional condition,” Chuvilo says. Financial businesses in the U.S. tend to use green and blue -- the color of money plus a color that soothes. (Fun fact: In China, financial firms prefer red.) So Ramotion experimented with the palette until they settled on a mixture that felt unique yet familiar enough to be trustworthy. “It was a much more involved process than I thought it would be,” says Mokhtarzada. 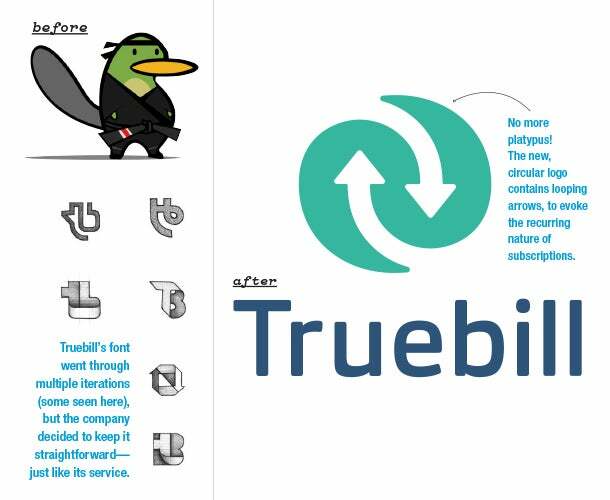 The Truebill reboot debuted on January 28. At that time, it had 500 users. A month later, it hit 10,000 users. The change also inspired Mokhtarzada to think about other ways to live up to his company’s new name -- offering options to track users’ charges and recommending cheaper alternatives for services. “Our customers need to trust us first,” he says.